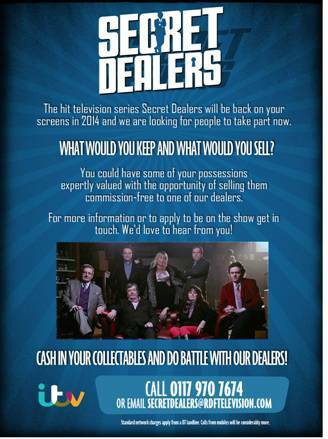 We are now producing the 5th series of our popular antique series “Secret Dealers.” In the next series we would love to visit the Perth and Kinross area I was hoping you could forward the attached flyer and information to your Parish (or include in a newsletter) to help us to spread the word locally as it would be great to get your community involved. If you prefer I could always send you a few flyers in the post so please do let me know. Thanks in advance for your help and hopefully this will be of interest to your Parish!